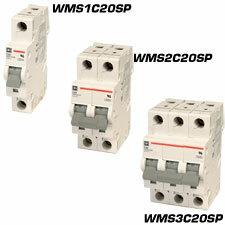 The WMS series has been discontinued. Please see the UL 489 series as a possible alternative or contact our Automation Engineering department. Offering maximum reliability and accuracy, the supplementary protectors fit various applications where a fuse may have been previously used. The advantage over fuses is that it is resettable and the device’s status is easily and clearly identified by the position of the handle and the flag indicator. With easy mounting of the device on a 35 mm (1.38") DIN rail it is now easier for the customer to select and apply this modular range, due to the smaller modular width of the device and accessories. The WMS supplementary protector is a dual-rated product for both AC and DC supplies, in accordance with UL 1077, CSA 22.2 and IEC 898 standards and is marked with CE in accordance with the Low Voltage Directive. With this dual standard product, you can include it within your design, knowing that, in the vast majority of cases wherever the equipment is used, the product is in line with the local UL, CSA or IEC (European) requirements. This is very important as the different areas of the world market draw closer together and the need for breakers that meet different standards is a common, everyday occurrence. It is to be applied in conjunction with a branch protector (if branch protection is required) and can be a replacement for similarly applied fuses. In addition to this, you are able to select a device that provides maximum reliability and accuracy to fit their various applications (of which there are many) due to the availability of a wide range of current ratings from 0.5 to 60 amperes and three different overcurrent characteristic curves. With easy mounting of the device on a 35 mm (1.38") DIN-rail and also the “Quick 3 Step” field mountable accessories, it is now easier to select and apply this modular range. In addition, utilizing the bus bar comb to connect multiple devices from a single power source, saves time as multiple wire connections are no longer required. Due to the smaller modular width of the device and accessories, it enables them to save space in their panel or equipment—which directly leads to cost savings! Some Models are Obsolete, Contact Sales for Replacement Models. 참고: Note: Some models are obsolete, contact sales for replacement models.